I was expecting to see Dr. Who regenerate into another form by the end of last week's season finale, since Peter Capaldi is sadly leaving the role, but surprisingly it did not happen. After refusing to regenerate, we are left with a cliffhanger as the first Doctor showed up mysteriously. On top of that, the current Companion, Bill, seems to have been written out of the show as well - which is too bad, I liked her a lot. I guess we will have to wait until the next Christmas Special to see what's in store for the future. Where does Doctor Who stream? It used to be on Netflix, then moved to Hulu. Is it on Amazon now? All of classic Who is on BritBox - it's a paid service (about $7/month) but has a free trial....and *tons* of other shows as well. As far as new Who...I think Amazon has most of the current series. When Peter Capaldi announced that he was leaving the programme*, he said that it would be at the end of this year's Christmas special. For that reason I was surprised to see him starting to regenerate in the season finale, though his fending it off by sheer will was pure Doctor (he also did it in Part 3 of "The Caves of Androzani"). Regarding today's cover, it's excellent but for one quibble: the Fourth Doctor's sonic screwdriver wasn't the amazing piece of advanced technology that it is in the new series. It was fairly impressive, yes; that's why producer John Nathan-Turner decided to get rid of it. But really, it was good for little more than a lockpick; the Eighth Doctor (in one of the audio dramas) got the idea of upgrading it to a handheld computer. Now, K-9, on the other hand -- especially the Mk II -- would be something that aliens might take an interest in. *Hey, it's a British show, so it gets British spellings! As for Bill? Well, at least she's not stuck being a Cyberwoman for the rest of her life. *See DW:TOS tenth anniversary special "The Three Doctors." **See DW:TOS "The Trial of a Time Lord" (6th Doctor era). Maybe that advise will be: "Ginger-colored* hair isn't all it's cracked up to be." *I'm posting this from America. So, it comes with American spellings. Lol! The aliens on the cover are actually Wrarth Warriors from the Doctor Who comic story 'The Star Beast'. Kris Marshall ought to be OK as a new Doctor, but he'll have to do something clever with the role because he is, frankly, a fairly lazy choice. You could do Abbott & Costello Meet Doctor Who with the tag "Who's on first?". 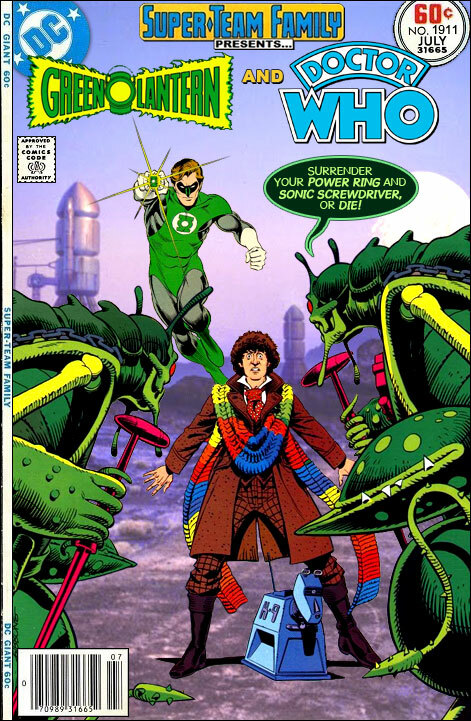 I'd love to see a GL / Doctor Who crossover actually happen. They've done GL / Planet of the Apes. Doctor Who would make even more sense. I watch it on BBC America, through Sling TV. They only have the current season on demand though. @Jesse Stewart: especially if they made POTA the homeworld of the Ogron mercenaries used by the Daleks! Image Hosting Sites - Any Recommendations? Legion of Super-Heroes Vs. M.O.D.O.K. Cyborg Vs. Ultron in : Murderous Malware!" Red Wolf and Jonah Hex in: "Home of the Brave!"